While it's not the longest wait between sequels, the fourteen years that fans have been waiting for a proper follow up to Crouching Tiger, Hidden Dragon have flown by like Chow Yun Fat himself. As early as last January we had been hearing reports of The Weinstein Company's eventual development and ultimate production of Crouching Tiger, Hidden Dragon: The Green Legend, but besides a couple of casting notices we hadn't really heard a lot about the film. Today we not only have a firm release date for the film's release, but we also have two gorgeous photos and some news on the film's unique distribution model. 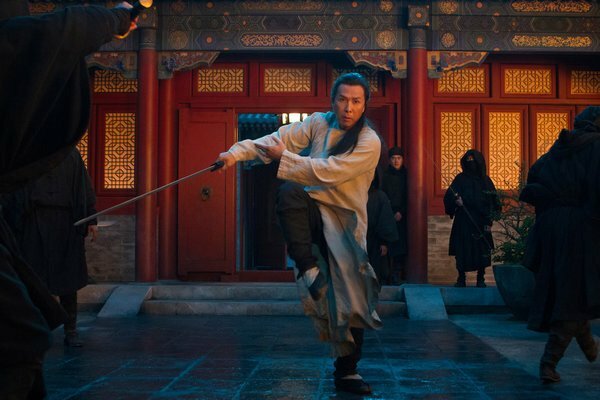 In an official press release today, Netflix announced that in addition to a limited global rollout in the IMAX format, Crouching Tiger, Hidden Dragon: The Green Legend will be the first film to be make its bow as a Netflix Original. Much like their acquisitions of such television shows as House Of Cards and even Arrested Development, Netflix and The Weinstein Company have reached an agreement for the film's August 2015 premiere to make itself at home on Netflix Instant streaming queues everywhere. "The moviegoing experience is evolving quickly and profoundly, and Netflix is unquestionably at the forefront of that movement. We are tremendously excited to be continuing our great relationship with Netflix and bringing to fans all over the world the latest chapter in this amazing and intriguing story." The effects that Netflix and The Weinstein Company have had on the evolution of distribution methods are undeniable, and the release of Crouching Tiger, Hidden Dragon: The Green Legend as a Netflix Original signifies another step down the path Steven Soderbergh and Magnolia started the industry down in 2005 with the simultaneous VOD/limited theatrical release of Bubble. Video On Demand has come a long way since those days, and Crouching Tiger, Hidden Dragon seems like it will be the film to usher audiences into a new era of home viewing. Of course, those of you who are interested in a larger scale visual experience, Crouching Tiger, Hidden Dragon: The Green Legend will also be on select IMAX screens throughout the world at the same time. Representing the IMAX camp was its Senior Executive VP, Greg Foster, who was just as excited about the unprecedented film release as Harvey Weinstein was. In particular, Foster sees the film as "...a high-quality, action-packed film that is right in our wheelhouse -- at the end of the summer blockbuster season." Next year is already crowded with films that'll be vying for the public's attention, yet this very fact could work in the favor of Crouching Tiger, Hidden Dragon: The Green Legend. By August, audiences are going to be starved for something more original and more artistic, and using IMAX and Netflix to be the exclusive sentinels of said content is a good idea on how to drum up business through curiosity and exclusivity.